By changing up the tiles just a little bit, you can make a big difference. Here, I've replaced selected 4" white tiles with four 2" tiles in our Carnivale style. Unique and fun. Four 2" Carnivale tiles set within a white diamond tile pattern. This would look great as a kitchen back splash. Different types of tiles placed within a white diamond pattern really makes a statement, and it's a fairly easy, inexpensive way to add a custom look to your white ceramic back splash. Craftsman Tiles in a white diamond tile pattern. White Diamond Tile Pattern with Splaces of Bright Glass Tiles = WOW! Bright Carnivale fused glass tiles enliven this white ceramic tile kitchen backsplash. A little touch of whimsy can make a big difference in your home. Look at how this plain white tile pattern comes alive with carefully placed Carnivale fused glass tiles in green, blue, orange, red, and yellow. Mix and match the less expensive ceramic tiles with custom made fused glass tiles for a unique look in your own home. 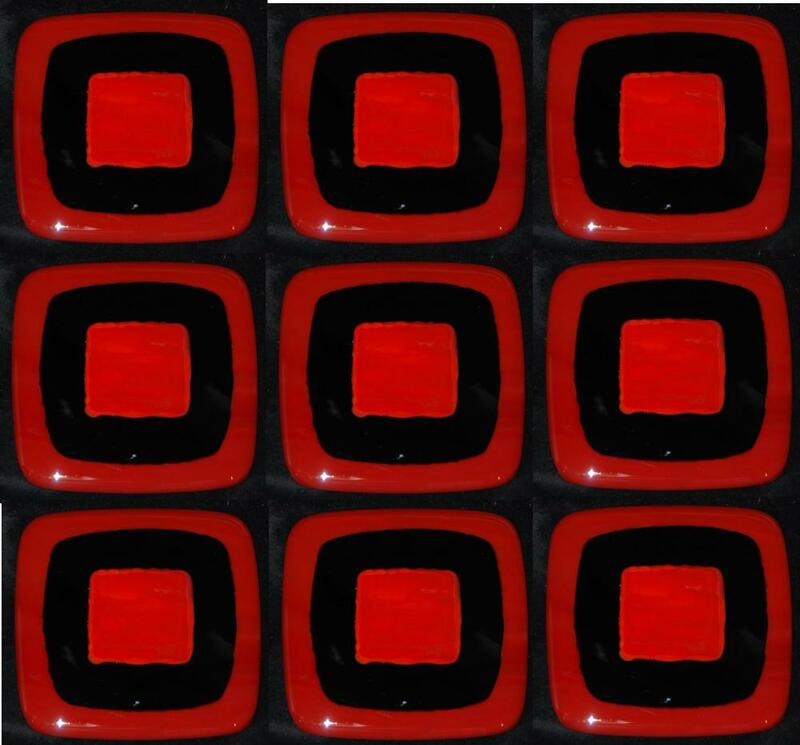 Red and Black Fused Glass Tiles -- Hot! 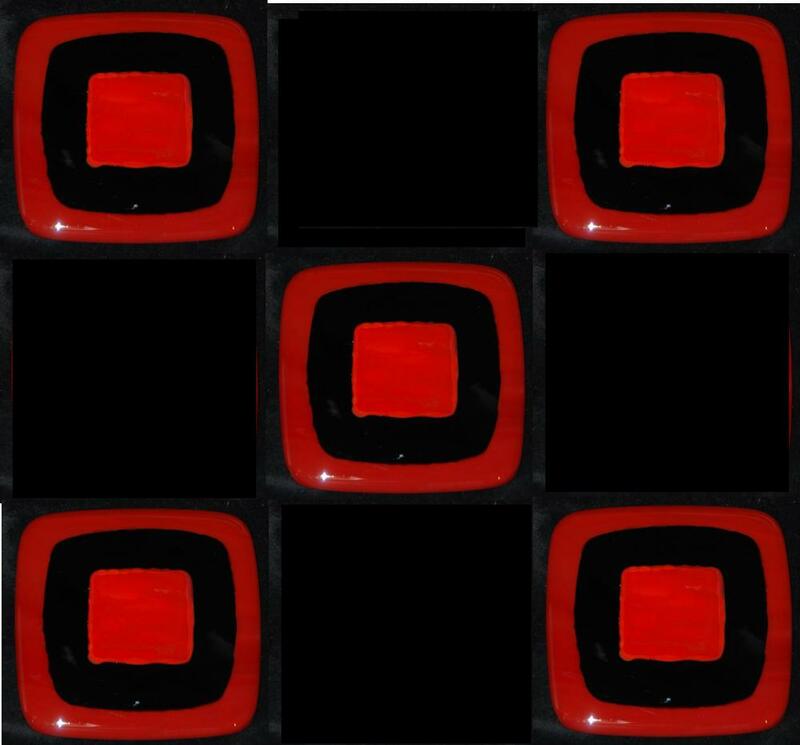 For someone who is bold and audacious, these custom fused glass tiles are perfect. Made of crimson red, black, and dark red glass, they are truly one-of-a-kind. These shown are 3" x 3", but we can make them in any size. If you love dogs, or know someone who does, these cabinet pulls are perfect! Each one features a handmade glass dog face tack-fused onto a solid glass (2 layers) background. Permanently attached to a standard sized cabinet pull, these knobs will add a complete custom touch to any room. A brown dog with spring green eyes on a matching green glass knob. The custom dog cabinet pull as seen from the side. Custom glass drawer pulls can be made with either a dog face or cat face. A blue and green dog on a white glass cabinet pull. Dogs and backgrounds can be custom made in just about any colors. Inspired by a customer who added cabinet hardware to the backs of our cat faces, we are proud to present our newest addition: Custom Cat Cabinet Pulls. Order your preferred cat color and background color. We make each cat by hand, tack-fusing them onto a two-layered glass background. Each knob is 1-3/4". For more info on our glass knobs, please visit our etsy shop here or contact us here. 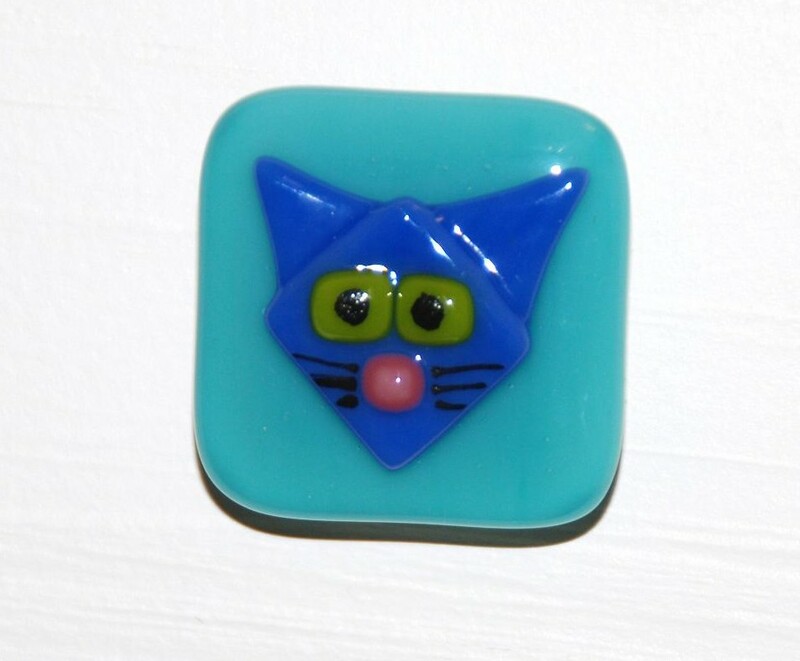 Blue cat on an aqua blue glass cabinet pull. 1-3/4". Soon to be installed in a British Columbia home, these "Carnivale" fused glass tiles are sure to help create the funky, whimsical look our customer wants. She promises to send us photos when the project is complete. We can't wait! These gold, white, and cobalt blue tiles are part of our "Carnivale" line of handcrafted fused glass tiles. Our British Columbia customer is installing them in her mostly orange bathroom. Four hand-painted fused glass tiles with lush trees and hints of summer flowers. When placed side-by-side, the tree limbs create arches. 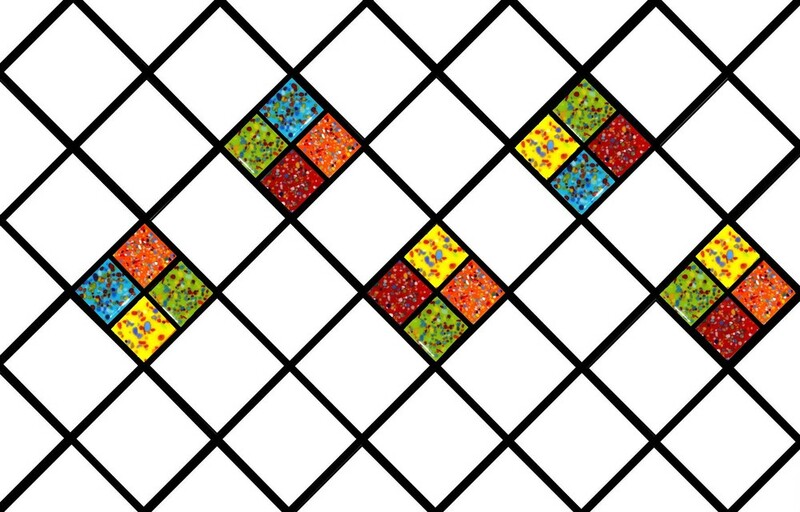 This effect occurred when I reverse the images on three of the six tiles. These fused glass tree tiles can be fully customized by changing the background color as well as the colors of the leaves and flowers below. Here are two examples. By changing the background colors and frit colors (acting as leaves), we can evoke any season, any feeling. 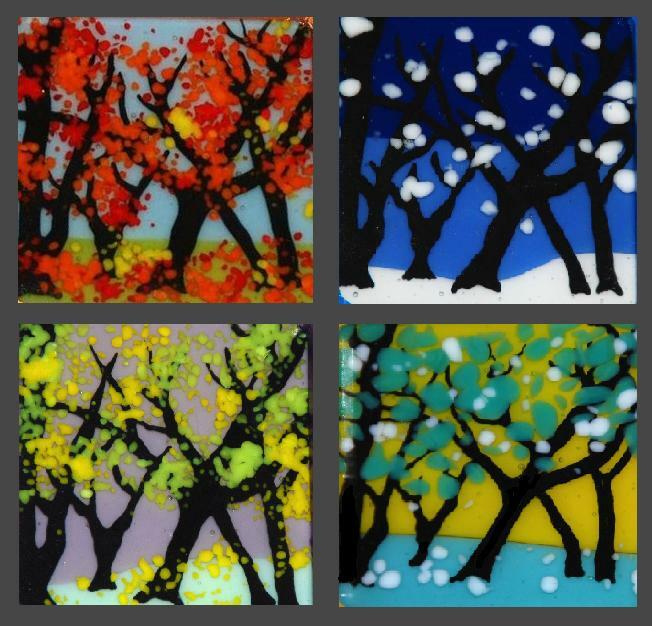 Here are our interpretations of Autumn, Winter, Spring, and Summer in our fused glass trees. We love making fused glass tiles! Throughout our five years as Omega Art and Design, and then Omega Glass, we have enjoyed creating tiles for our customers' kitchens, bathrooms, and even walk-in closets. We are excited to launch Omega Glass Tiles and reach out to DIY-ers, Pinteresters, and interior decorators everywhere. We are beyond excited as we focus on creating new designs, new styles, and new techniques for Omega Glass Tiles. How can we help YOU create the look and feel you want? Craftsman Collection of handmade fused glass tiles.